Asphalt Shingle Roofing - Performance Roofing, Inc.Performance Roofing, Inc.
Asphalt shingle roofs are the most common type of roofing system in New England. The combination of ease of installation, affordable cost and traditional styling make asphalt shingles a popular choice for roofing Portland and Portsmouth-area homes. Performance Roofing is pleased to offer the high quality line of CertainTeed shingles. We are one of very few Portland roofing contractors to achieve the designation of CertainTeed Master Shingle Applicator, a status that allows us to provide more choices in shingle styles and additional warranty protection for our customers. For homeowners desiring a traditional New England look, asphalt shingles can be a great choice. Depending on the grade of shingles you choose, an asphalt shingle roof can be among the most affordable options. In certain circumstances, shingles can be installed over an existing roof of asphalt shingles, eliminating the need to remove the old roof. Roofs made out of asphalt shingles are available in different grades, offering different levels of protection for your home. The better the grade, the longer the life expectancy of your Portland roofing system or Portsmouth roofing system, which can range from 15 to more than 30 years. 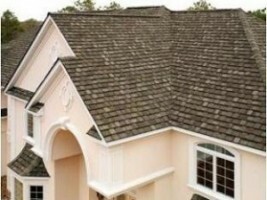 Asphalt shingles are available in a variety of colors and styles. The asphalt covering is actually a composite made up of either a fiberglass or rag mat with asphalt, which is covered with colored mineral granules. WE’RE THE PORTLAND ROOFING COMPANY THAT PERFORMS! “Performance” is part of our company name, and you’ll enjoy the benefits of superior performance and customer service when you choose us as your Portsmouth or Portland roofers. Our expert crews are factory-certified and trained in the latest shingle installation methods, ensuring that your Portsmouth roofing system or Portland roofing system is installed with attention to detail and craftsmanship.